I’ve already acknowledged my energy illiteracy. I’ve also acknowledged that I have much to learn about modern homesteading. This means that decisions that we used to be able to make quickly now require becoming more informed, and this takes time. Take our roof as an example. We need to replace our cedar shake roof. It’s pretty old and we don’t feel great having a highly combustible roof in a wooded area. But there are a lot of roofing options. Which one makes sense from a green perspective? There are three factors we are considering: 1. Environmental impact of roofing materials, 2. Suitability as a base for future solar installation, and 3. Suitability of the roof for water collection. I’ve “delegated” the research on this one to Derek. 🙂 And he has been researching, and researching some more, getting information, new information, conflicting information, comparing various costs, weighing cost/benefit, etc. So it’s not easy. Derek will do the write up soon about the decision we ultimately make. 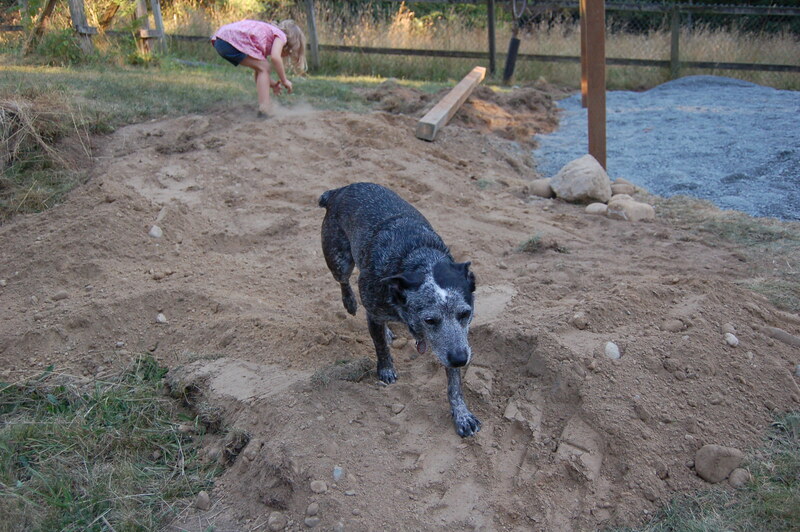 The other challenge for us is that our yard is now all torn up. I’m very excited that construction on the green house began today, but I forgot how much heavy equipment tears up a yard. On the plus side, the kids were thrilled that our yard is now a dirt and gravel pit and had a great time playing in the mess. So did the dog. I also tried out a carbon footprint tool today. These tools estimate the carbon impact your lifestyle has on the planet. On the MSN Green site, I found a useful carbon calculator. According to the tool, my family and I contribute 10.75 tons of carbon to the environment each year. This is above the national average of 7.5 tons. Since we joined the green energy program, the biggest impact comes from our car (a Volvo V70 which we drive about 10k per year) and from flying. Most of my trips are business trips. When I took the flights out of the calculation, our impact dropped to 5.05 tons. That’s a huge difference. Those flights have as much impact as my house and car driving. Pretty amazing. This entry was posted in Carbon, General, Homesteading, Solar, Water collection and tagged carbon calculator, carbon footprint, Green living, Green roofing, greenhouse, Solar, Water collection. Bookmark the permalink.